There is a move afoot to reprogram humanity. To redefine it in the limited terms of scientific understanding, place it in a box, and then, all wrapped up in a pretty package, attempt to deliver this convoluted mess to us as progress. According to whose design? Well, the so-called “scientific” one, of course. 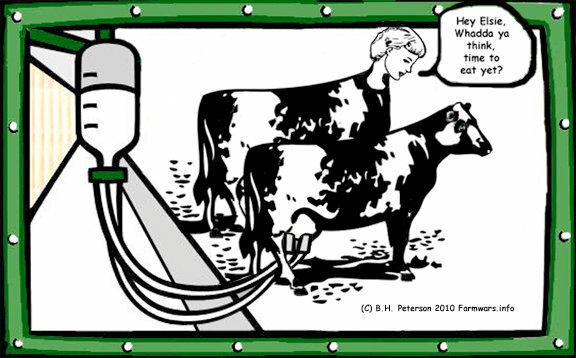 And if this means combining cows and humans, goats and spiders, man and machine in order to achieve the goal? Well, so be it. After all, the only thing that is important is the end result. And the end result is that a few will obtain immortality… or so they think. And if a few eggs get broken in the process, well, that is the price paid for success. This is Transhumanism – the natural culmination of something called reprogenetics. Some call it designer evolution. Reprogenetics will involve advances in a number of technologies not yet achieved, but not inherently impossible. Among these are improvements in interpreting the effects of different expressions of DNA, the ability to harvest large numbers of embryos from females, and a far higher rate of reinsertion of embryos into host mothers. The end result, according to Silver, is that those parents who can afford it will be able to pick out the genetic characteristics of their own children, which Silver says will trigger a number of social changes in the decades after its implementation. Possible early applications, however, might be closer to eliminating disease genes passed on to children. According to Silver, the main differences between reprogenetics and eugenics, the belief in the possibility of improving the gene pool which in the first half of the 20th century became infamous for the brutal policies it inspired, is that most eugenics programs were compulsory programs imposed upon citizens by governments trying to enact an ultimate goal. It becomes quite apparent, after reading the quote above, that the main difference between reprogenetics and eugenics is consent, according to Lee M. Silver. Eugenics – forced. Reprogenetics – consented to. Same thing, different mode of action. From the forced culling of those deemed inferior to creating a superior race through genetic engineering, the end result is the same. Those deemed inferior are eventually culled from the system using DNA manipulation techniques. 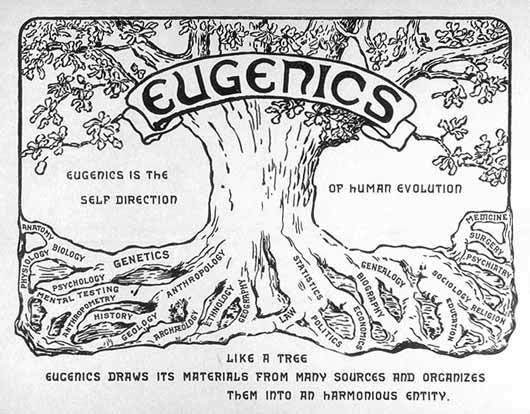 Eugenics – renamed and defined as scientific progress. A life-saving technique that can reprogram the human race and create the ideal human family. That’s the spin. I’m sure the promoters said the same thing about nuclear energy. Dangerous? Naw…. We know what we are doing. Arrogance. So, let’s take this technique of reprogramming humanity through reprogenetics/eugenics and dig a little deeper, shall we? Genome Compiler is built on the idea that biology is information technology. We can design and program living things the same way that we design computer code. Genetic designers today are still writing in 1s and 0s – they lack the missing tools to design, debug, and compile the biological code into new living things. At Genome Compiler, we’ve built just that – a simplified solution for designing DNA. [youtube]9RaRS8HfCNI[/youtube]We are inspired by the breakthrough research done by the JCVI and Harvard with their achievement of whole bacterial genome engineering, as required for functional changes in the form of new codes, new amino acids, safety and virus-resistance — and a vision of making biological design easier, cheaper, and open to people outside the research labs. After all, when all is said and done, DNA is simply DNA, and mixing it up has no inherent consequences, right? That is what we are supposed to believe. And who is to say what is human and what is not? Aren’t we all made of molecules? Whether somebody is implemented on silicon or biological tissue, if it does not affect functionality or consciousness, is of no moral significance. Carbon-chauvinism, in the form of anthropomorphism, speciesism, bioism or even fundamentalist humanism, is objectionable on the same grounds as racism. If we want to be half human, half frog, isn’t that our right? If everything is the same, then anything goes. This is put forth in the guise of freedom of choice, freedom from disease, and freedom from suffering. Actually, this is a sure road to slavery, disease and suffering, and a path towards erasing who we are and simply becoming just another set of molecules on planet earth, much like a chair, or car, or vacuum cleaner. Biological evolution is perpetual but slow, inefficient, blind and dangerous. Technological evolution is fast, efficient, accelerating and better by design. To ensure the best chances of survival, take control of our own destiny and to be free, we must master evolution. Many factors conspire to warp our reasoning about risks and benefits as individuals. The bad news is that such foolish thinking has been institutionalized and turned into a principle. Zealous pursuit of precaution has been enshrined in the “precautionary principle”. Regulators, negotiators, and activists refer to and defer to this principle when considering possible restrictions on productive activity and technological innovation. In this chapter, I aim to explain how the precautionary principle, and the mindset that underlies it, threaten our well-being and our future. In other words, according to one of the top leaders in the transhumanist movement, the precautionary principle actually endangers us. How convoluted can you get? So, throwing caution aside, onward we go by experimenting through DNA manipulation to create a world where the pseudo-science of a scientific dictatorship rules supreme. The future of war is going to look really, really weird. The “super soldier” research that DARPA (the Defense Advanced Research Projects Agency) is working on right now is unlike anything we have ever seen before. If DARPA is successful, and if the American people don’t object, the soldiers of the future will be genetically modified transhumans capable of superhuman feats. Yes, there are people who are actively attempting a complete takeover of humanity in order to set themselves up as supreme beings. To transcend physical boundaries by intermixing any DNA that so-called scientists think is appropriate, discard the precautionary principle as ‘too dangerous for proper evolution,’ full speed ahead, meld man, machine, computer, and eventually, transcend to Godhood. It doesn’t matter if it works, it doesn’t matter if it is sane, it is a plan in the works. And the people who are involved think that they know how to create a better man. Julian Huxley, brother of Aldous who authored Brave New World, first used this word (1957): Transhumanism. Huxley was a member of the British Eugenics Society, eugenics being the foundation of Transhumanism. In 1927, the Rockefeller Foundation provided funds to construct the Kaiser Wilhelm Institute for Anthropology, Human Heredity, and Eugenics in Berlin, which came under the directorship of the appropriately named Eugen Fischer. Adolf Hitler read Fischer’s textbook Principles of Human Heredity and Race Hygiene while in prison at Landsberg and used eugenical notions to support the ideal of a pure “Aryan” society in his manifesto, Mein Kampf (My Struggle). What was termed in its early stages as a pure “Aryan” society, is now being repackaged as a pure “Transhumanist” society in which DNA is programmed to conform to the design of a scientific dictatorship, and sold as the salvation of man. The New Age of ascention. Same story, new box. When will we learn? Except in this case, it is not the beneficiary of the technology’s sacrifice that is required, but the sacrifice of dedicated and ignorant servants and an unwitting populace. We sacrifice our health, wealth, and minds to the slavery of junk science that says it is okay to maim, torture, and impoverish millions so that a few may gain. It is okay to run widespread experiments on humanity so that a few may benefit from those experiments and transcend to a God-like state and rule over the universe. It doesn’t matter if you believe it, or if I believe it. It doesn’t have to be rational or sane. What matters is that people with enough money and power to go forth with this agenda do believe it, are working steadily towards it, and know how to market it in order to get the public to accept it as beneficial. 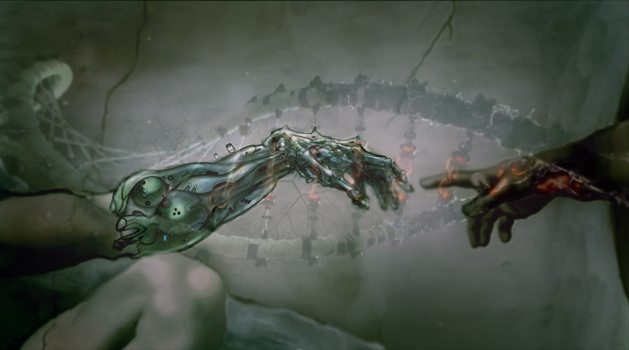 Transhumanism is being sold to the public as bringing forth a new age of enlightenment. This story is as old as the Biblical account of the Garden of Eden, where Lucifer, masquerading as the angel of light, tells Eve that he knows a better way. It is also being touted as an extension of Darwinism: another step in the evolutionary process – the better, scientific way, because the slow, biological way is simply too dangerous and inherently unpredictable. Humans are about to decommission natural selection in favour of guided evolution. Darwinian processes gave humanity a good start, but Homo sapiens can be improved. Owing to advances in genetics, cybernetics, nanotechnology, computer science, and cognitive science, humans are set to redefine the human condition. Future humans can look forward to longer lives, enhanced intelligence, memory, communication and physical skills, and improved emotional control. Humans may eventually cease to be biological and gendered organisms altogether, giving rise to the posthuman entity. Human enhancement will irrevocably alter social arrangements, interpersonal relationships, and society itself. And there’s also the added potential for nonhuman enhancement. Much better to trust in man and his scientific knowledge to create a better evolutionary path, and manipulating our DNA is that way. And just who comes to mind as an expert at manipulating DNA and public perception? Remember when Craig Venture of Atlas Venture created Synthia, a synthetic life form, and partnered with Monsanto? Well, it appears that Monsanto and Atlas Venture are working on a new type of genetic engineering using RNA. Is this the disruptive technology that I mentioned in my article cited above? Generations of high school kids have been taught that only about 3 percent of the human genome is actually useful—meaning it contains genes that code proteins—and the rest is “junk DNA.” Cambridge, MA-based RaNA Therapeutics was founded on the idea that the so-called junk is actually gold, because it contains a type of RNA that can flip genes on inside cells, potentially offering a new approach to modulating diseases. RaNA is coming out of stealth mode today and announcing a $20.7 million Series A financing led by Atlas Venture, SR One, and agricultural giant Monsanto (NYSE: MON). Partners Innovation Fund also participated in the funding. RaNA Therapeutics is pioneering the discovery of a new class of medicines that target RNA to selectively activate protein expression, thereby enabling the body to produce desirable proteins to treat or prevent disease. RaNA’s novel therapeutics work by precisely activating the expression of select genes within the patient’s own cells, increasing the synthesis of therapeutic proteins. The company’s proprietary RNA targeting technology works epigenetically to make it possible, for the first time, to increase the expression of therapeutic proteins with exquisite selectivity. Monsanto is not working at “Curing world hunger through biotechnology.” That is a successful smokescreen and marketing slogan gone viral. Edward Bernays, the father of marketing propaganda to the masses, would have been proud. 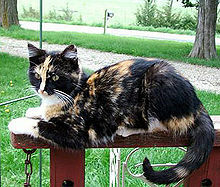 Remember the definition of reprogenetics in the beginning of this article? Reprogenetics is the genetic engineering of man to create a human race according to scientific design. Well, it is 2013, and we now have the tools to silence and turn on genes through RNA manipulation. And it’s coming to us courtesy of Monsanto, the chemical/life sciences company that brought us Agent Orange, PCBs, and most of the genetically engineered ingredients in 80% of the processed foods we eat every day.